Â Â Â Â In an earlier post I mentioned housing density and how it impacts the surrounding community. The main point of the article was to show that density in and of itself is not a bad thing. However, if a dense development is not properly planned and located, it will almost certainly have a detrimental effect on the community. Â Â Â Â When writing that article, I was not aware of the aspirations of a developer to build a high-density rental development in Herriman. Considering the proximity to Daybreak, this development will almost certainly affect those residents of Founders Park Village. Daybreak as a whole will be affected by this new development as the new high school for the area will be located adjacent to the development. Â Â Â Â The new development will be called Two Creeks. 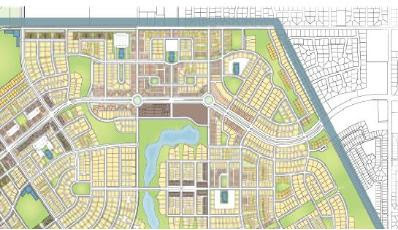 Miller Timbergate Associates LLC appeared before the Herriman City government to gain approval for the first two phases of the project: Timbergate and Farmgate. These two phases will be dense. At around 20 units per acre, this will truly be the densest development around. Even Daybreak following the concept of new urbanism cannot claim densities as high as this development. Even if densities get higher in Daybreak in the future, they will be integrated into the community with a transect style of planning. Two Creeks is located near homes that are not even close to the planned density of nearby developments. Imagine your home next to multiple 4 story, 32 unit complexes. The Two Creeks plan suggests that the developer wants to develop his land his way without regard to the surrounding community in a piecemeal fashion that really doesn't fit. Â Â Â Â The estimated population of the two approved projects is 1,696 people. With this many people, traffic is a real concern. However, this development will be located next to the proposed path of the Mountain View Corridor. By doing this, much of the traffic from the development will likely be dissipated. Not a bad idea right? Most local governments are in cooperation through Envision Utah to put higher densities next to the transit corridors. One problem with this plan is that it assumes that the Mountain View Corridor will be built and that when it is built that it will not be a toll road. If it is a toll road, I cannot imagine many of the residents of Two Creeks utilizing the road. TRAX is nearby, but these residents will be made to cross not only 118th South, but also the Mountain View Corridor to access it. Unless significant infrastructure is put in place to make this crossing safe, you will see additional problems. It will just be easier for them to hop in a car and drive. The location of this development, on the fringe of Salt Lake County, should also be a consideration as the price of gas would prevent the necessary long commute for many of these residents. Most of which are calculated to not have substantial financial means. Â Â Â Â The traffic problem will only be exacerbated by the fact that the new area high school will be located literally within feet of the development. I wonder if all of the sports facilities that come along with the high school will be perceived as amenities for Two Creeks. Also, with the concentration of a lower socio-economic population you will have dual working parents and transient families. With many of the parents gone, I can imagine quite a few students hanging out in Two Creeks without supervision after school. Â Â Â Â The single worst part of this development is that it will concentrate thousands of citizens of a lower socio-economic class. As stated in an earlier post about density this can cause a multitude of problems. Crime and social disruption will increase in this area with such a large concentration. This cluster will enable all of the myths that are associated with a higher-density development to have an opportunity to come true. Â Â Â Â I have it from a good source that these units are meant for government Section 8 housing. The Section 8 program allows those who qualify to pay rents that are adjusted to their income. 30% of their income goes to rent. For example, if a low-income family made 1500 dollars per month they would spend about 450 dollars for rent each month. The government covers the rest. This program can truly help those in need, but the idea is to spread those who are on the program over a wide geographic area not concentrate them. We already have Section 8 families in our community, but they are dispersed. Â Â Â Â So why is this happening and why now? With the housing market being in doubt there are many people waiting out the market in hopes to buy when the market starts to go up again. Other people cannot afford a mortgage as the new lending criteria prevents them from qualifying. So what do these people do? They rent. With Utahâ€™s strong economy, there are more people moving to the valley in search of jobs and many will opt to rent for a variety of reasons. All of this combined has pushed monthly rents up 10% in the last year alone. The rental market is starting to look really attractive to a lot of investors. I would not be surprised to see a lot of developments pop up in various communities that are high density and havenâ€™t been integrated properly. That is why people need to be more involved at the local government level about what happens in their community. I believe the Sunstone residents (just to the west of Daybreak) would agree with me as they seem to have attended the relevant meetings and have even appealed the approval of Two Creeks. Hopefully this mess will be stopped before it is too late. Housing density has been and will remain the most common disagreement with regards to new development in existing towns. The politics surrounding this issue can be fierce with strong emotions on all sides. The battle over density usually starts when a developer purchases land with plans to build medium to high-density residential. One resident will hear about the pending project and will rally the troops. This person is usually referred to as a NIMBY which stands for Not In My Back Yard. This neighborhood watchdog will then broadcast the message that an evil developer is trying to profit with a new development and does not care about its impact on the surrounding community. This was the case with Daybreak and many other new urban communities across the nation. The question that I would like to ask most NIMBYs is this: how did you inform yourself about the topic of density and its effects? Some of them call on first-hand experience. The neighbors near many developments complain about the traffic that the development is causing. Of course while the infrastructure that will accompany the development is only starting these neighbors pass judgment by what they see immediately. This short-term, subjectivity should not be taken as fact, but many NIMBYâ€™s present it as fact. Many NIMBYs that I have talked to use the words â€œits just common senseâ€ all too often when trying to explain their information source. While I feel that common sense is a valid tool that cannot be underestimated, I also feel that it is sometimes confused with myth. These myths are traditional in my opinion. Passed down through the generations and are added to with each new generation. The history of where these myths started reaches back as far as the 1800s. The US started as an agricultural nation and transitioned into an industrial nation with factories and mass production. This transition was accompanied by waves of immigration from Europe. Each new wave contained different ethnic groups that were overtly discriminated against. This discrimination clustered these immigrants into densely populated areas with the least desirable jobs. This segregation along socio-economic status lines resulted in the materialization of many of the myths that are associated with density. Fast forward to the age of suburbia that started after World War II. Being enabled to travel long distances via automobile, people could more economically live in the suburbs and further segregate themselves. Zoning use ordinances specified separation of land use and from then on commercial could no longer coexist with residential. In many cases this meant separation of density as well. Fast forward again to the 70s and 80s where the government decided to build â€œproject housingâ€ which not only segregated people of lower socio-economic status, but actually concentrated them. Many of these were an immediate failure with rampant crime and social problems. The images created by these projects reverberated with further intensity in the media particularly in movies and television. The â€œinner cityâ€ was a dangerous crime ridden area only suitable for those â€œotherâ€ people. All of these events perpetuated the myths of density with a simple philosophy: guilty by association. So what is the real story behind density? The best way to answer this question is to address the myths often cited by NIMBYs one at a time. Myth: Density will lower the value of my home. Many things can lower the value of a home, but density is not by itself one of them. In fact researchers have conducted many studies on single-family housing that is located in proximity to dense residential developments. The conclusion of these studies is that there is not a significant difference in the appreciation rate of those single family homes located in close proximity to high residential developments and those single-family homes located further away. In fact the percentage of appreciation is 2.9 versus 2.7 percent. This is not a significant difference. However, if you have an apartment building located next to your home that is 5 stories tall, over 30 years old, the grass is browning, windows are broken, loud music is blaring from the windows, and the paint is literally peeling like a sunburn, then this will obviously lower the value of your home. Of course, if a single family residence was in the same state, then it would lower the value of your home as well. Another myth is that dense housing will create more traffic. Obviously if you add more cars to an area you will have more traffic. However, research has proven that higher density housing decreases traffic per person. Single family detached homes average 10 car trips a day. Compare that to the 6.3 car trips per day made by people living in townhomes and condominiums. Density is also needed for public transportation to be feasible. The Mid-Jordan TRAX line would not extend to South Jordan at all if not for the density that will make up the Daybreak Town Center. This mode of transportation will bring an additional choice for transportation that is likely to be used considering gas prices. Daybreak further mitigates traffic by having most necessities within walking distance which encourages the two-legged commute.The most prominent myth about density is that it creates crime. This claim is absolutely false. Numerous studies have been conducted and the conclusion is that per population, crime is the same in higher density housing as it is in single family housing. The perception of crime is perpetuated when the observer holds an entire apartment complex to the same standard as one single family home. So when three juveniles from the same complex commit a crime and the police show up at the apartment complex three times in one year, it is considered â€œcrime ridden.â€ On the other hand if the police show up for a juvenile in a single family residence this is considered an â€œanomaly.â€ Crime research indicates that crimes increase in accordance with certain socioeconomic indicators such as education attainment, unemployment (particularly of males), and the poverty rate. The final main myth is that dense residential housing is unattractive and is only desired by lower-income households. Considering the changing demographics and preferences of consumers, this assumption is not based in reality. This market appeals to empty-nester and first-time home buyers tremendously. As with anything in real estate it is all about location, location, location. You can buy a single-family home in some locations for half of the price of a town home in south Jordan. Considering that the average income earner in Utah currently cannot purchase high-density housing in many areas, I would have to say that it is not just the poor that are moving into condos and townhomes. If the housing has a good design and is well maintained it will attract quality residents who care about and participate in their community. So who is winning this battle, the NIMBYs or the New Urbanists? The New Urbanists have the clear lead, but this depends greatly on where you live. In North Dakota and Oklahoma , the NIMBYs are holding their ground. If you live in Utah , Colorado , Texas , Florida , or California on the other hand, the New Urbanists are definitely ahead of the game. Since its inception in the early 80s, New Urbanism has grown at a phenomenal rate in most states. Locally, more and more new urban developments are popping up. They are called by different names such as smart growth or transit oriented developments, but they are the same with respect to density. In fact, South Jordan will shortly be surrounded by these developments. With the Herriman Towne Center , Daybreak, Jordan River , and other future communities coming to light, New Urbanism will also be the future of development locally. A number of strong forces demand this density. Energy costs demand homes that are more efficient, smaller, easier to take care of, and closer to the necessities of life. Businesses now want to locate their operations in communities that are vibrant, walkable, and have transit nearby. Density is the vehicle that has to be used to accomplish these attributes. The government wants density as it allows for less expenditure on infrastructure per tax payer. Finally, people are demanding more density and they are voting with their feet. The success of dense New Urban communities speaks volumes about this demand. Density will have its place in the future of South Jordan, but if not planned correctly it can cause problems. Density cannot be thrown in a community in a half hazard manner in order for the developer to make a buck. Instead it should be planned and integrated correctly according to transect planning and community needs. These new developments must feature good designs that are sensitive to the context of the surrounding community. 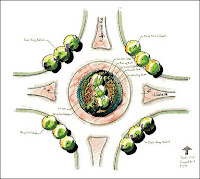 These designs and features must be maintained by a community organization such as a HOA. I can see why many NIMBYs are opposed to housing density, but assumptions should not be made based on false associations of the past. To those NIMBYs who will fight till their last breath any development that has more density that 2 units per acre consider if your beliefs about density are actually true. Also consider if your energy might be better spent ensuring that these developments are integrated properly instead of trying to ban them all together. Density is here to stay. Instead of a battle of how many units per acre, we need to ensure that these units are built, maintained, and located in a fashion that will enhance the community for all of us. Â Â Â Â In the grand scheme that is Daybreak, North Shore will bring a large amount of units at a density that has not yet been seen in this new urbanist community. In fact, Kennecott recently changed their projections for the total number of homes to be located within Daybreak. The number initially started at 13,600. This number has since increased to 20,000, almost a 50 percent increase. 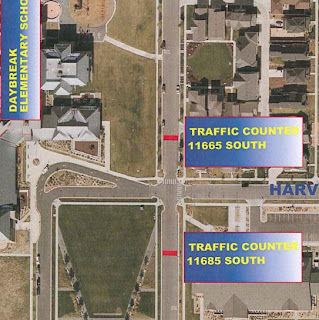 The recent planning maps for Daybreak show an increase in density in those properties East of Oquirrh Lake. Why did this change come about? I can only speculate, but I will be researching this issue in the future. One thing is for certain, North Shore has signaled a change in direction for future development at Daybreak.